It began in 1917 with a man hunched over his small wooden desk, 20-inches square, working on his craft as a cobbler in the Italian seaside town of Casette d’Ete. Gommino driving shoes, $425, Tod's, The Forum Shops at Caesars. 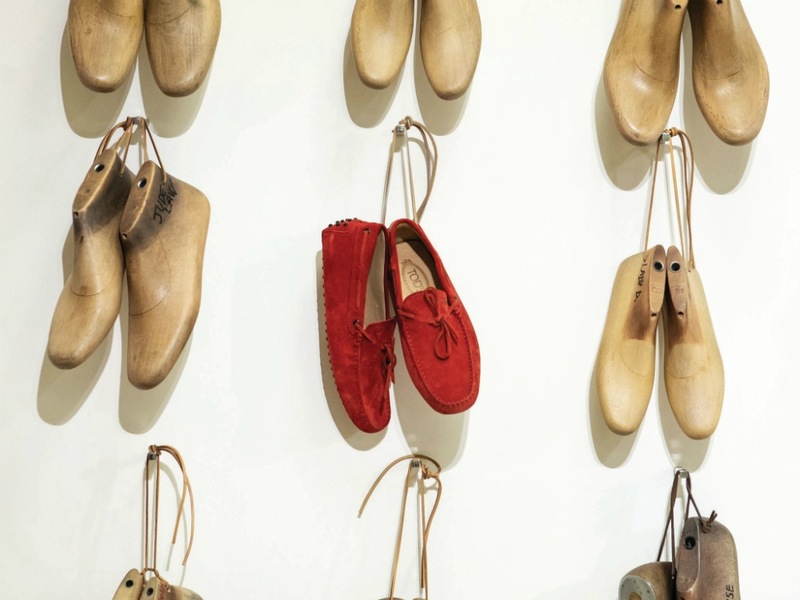 Sawdust fell to the floor—a result of sanding his wooden shoe form—as he eyed the instep, checked the curve of the heel and gauged the measurements to create a “last,” or a shoe form. Filippo Della Valle had amassed savant-level artistry of shoemaking. He used his eye for accuracy, his hands to craft and his heart: the magic ingredient. Today, Filippo’s table and impassioned spirit uphold the Tod’s production factory, still located in the same town, under the guise of his grandsons Diego and Andrea Della Valle. In a mere 100 years, Tod’s has flourished, building the largest production center of luxury footwear in Italy. It is here the iconic Gomminos, fine leather goods and ready-to-wear for men and women are crafted. Walled windows blanket the massive space in natural light; one-of-a-kind artwork from the likes of Vanessa Beecroft line the halls; and expert chefs serve lunch, making the site an indelibly poised place to work. As default locals, Tod’s employees are co-workers and neighbors, sometimes even familial. Artisanship is often generational, knowledge passed from father to child like the Della Valles themselves. The fingers that forge the products, which are predominantly made by hand, make all the difference in quality. The greatest exemplification of excellence: the Gommino loafer. A Gommino’s raised treading (“gommino” translates to rubber pebble in Italian) verifies a Tod’s sole on the street, but nearly 900 steps of production are required prior. First is leather qualification. An extensive team is responsible for the insurance and quality check of each inch of leather used. Once a leather sample is selected, the team must qualify a massive order, the process of which can take as long as five weeks. There is the microscopic inspection to ensure texture, a pressurized thickness check to detect durability and an olfactory inspection to confirm the tannery’s treatment is vegetable rather than chemical. Machines then test the leather’s erosion, both in color resilience and its ability to withstand wear without tear. As for the shoemaking process, a designer sketches the style that will be made, then two artisans shave a wooden prototype or “last” with the same tools Filippo used circa 1917. Adhesive paper wraps the form, and the designer hand-draws the shoe directly onto the paper to see how it will fit. Next, artisans man their stations: A patternmaker mocks a cardboard roadmap for the cutter, who slices the leather and hammers the tread holes before passing it to a seamstress to fuse sole to shoe. Before being placed in its orange-and-brown box, each Gommini is embossed with the house’s name, a stamp of approval from every hand it took to create.